Why is it a recommended game? As puzzle a game, 'Slice It' has a nice engaging progression from very easy to quite difficult, appropriate hint support to keep things moving along and a very simple and intuitive user interface. The game presents the player with a closed region (simple or complex) and a challenge to divide it up (dissect/cut) into a specific number of pieces (sub-regions) using a specific number of dissecting lines (that you must draw to cut up the original region). Each time you draw a dissecting line across the original region it creates two or more pieces (two if it is your first cut, one additional if your dissecting line only cut through one sub-region, or multiple additional if you cut across multiple existing sub-regions). If you manage to create the correct number of sub-regions while using up all of your assigned dissecting lines (cuts) then your effort is labeled as clear. Each adequately dissected region is given a star rating and a diagram is presented showing the relative sizes of each of the pieces. The rating ranges from 1 to 5 stars depending upon how consistent the pieces are in size. Initial challenges seem to allow a great deal of leeway but improved accuracy is expected as you move through the levels. If all of the pieces are exactly the same size (down to the 0.1%) then your effort is judged to be ‘perfect’ and you get extra badge on that challenge. Good ratings earn you hint points that you can cash in later when you are stumped by a future puzzle. To support your slicing activity, you might use the inherent symmetry of the region presented (reflective or rotational), the power of overlapping cuts (2 slices can make 4 pieces), vertices (to align), congruent line segments (to identify sub-regions of equal size), the underlying grid (to estimate lengths or supporting estimation by counting of squares), and your knowledge of area relations (e.g., a triangle of equal base and height may not look the same, but has the same area; similarly with parallelograms). The challenges progress nicely - starting with simple symmetrical regions with relatively intuitive dissection lines to generate a few congruent pieces and progressing through complex asymmetrical regions with many dissection lines generating many non-congruent pieces (but still of equal area). This makes it accessible and interesting to a wide variety of skill levels. Even if the child can’t yet articulate a reason for their slicing pattern, they are given feedback on each of their efforts, and can improve. This improvement may be achieved through grinding (try, try, again) or reasoning, but all efforts have some potential to enhance the child’s pool of experiences and support the development of their intuitive understanding. It is expected that greater benefits will be derived if the child is challenged to work with another child or tutor to explore the game. As they explain the reasoning behind their attempts they will be reflecting on and expanding their understanding of the terms and their related concepts. As they listen to others, they acquire new vocabulary and enhance the semantic value of the words and concepts – either by hearing correct claims/connections, or by hearing and challenging incorrect claims/connections. 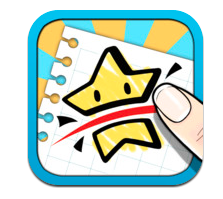 Try using this app as a 5-10 minute warm-up activity for a few weeks in your class. At the end of each session ask a few students to share examples of regions that they had mastered during the session (to support this, have them note the challenge number, or teach them how to make a snapshot (power down + home)). You might also encourage the students to expand their use when they are finished other in class activities, and/or share the app in a newsletter or blog as one of several recommended apps that you will be using in class. As a game, ‘Slice It’ is a winner at 99 cents. However, when you consider that ‘Slice It’ is also a very effective and engaging geometry exploration tool it suddenly represents outstanding value.